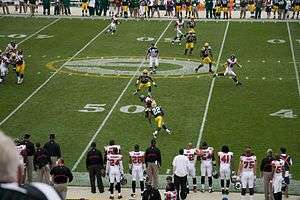 The 2008 Green Bay Packers season was the 89th season in the National Football League for the Packers and their 90th overall. They looked to continue success after posting a 13–3 record in 2007, but they failed to do so and finished the season with a losing 6–10 record and missed the playoffs for the first time since 2006. The Packers held their training camp sessions at Clarke Hinkle Field across the street from Lambeau Field. Practices were moved inside the Don Hutson Center during inclement weather. St. Norbert College served as the team base for all living arrangements for the 51st consecutive season. Players were expected to report on July 27, and practices commenced the following day and continued through August 27. Throughout the thirty one day span, seventeen included public practices. For the third straight year, night practiceswere again a part of the training camp schedule under Head Coach Mike McCarthy. Seven night practices, all beginning at 6:30 p.m., were scheduled. Most of the team participated with exception to recently re-signed running back Ryan Grant, and cornerbacks Al Harris and Charles Woodson. All three were healthy but did not participate. Brett Favre also was not in attendance due to the fact that he was just reinstated back into the NFL earlier in the day. The Packers started the fourth quarter with the ball with rookie quarterback Matt Flynn under center. After going three and out, the Packers were forced to punt. 4 plays later, Charles Woodson intercepted Brian Griese and returned it for a lead changing touchdown, making the score 21–20 with 13:43 left in the 4th. After forcing the Buccaneers to punt again, Matt Flynn lead another uneventful drive and Tampa Bay responded with a field goal to take the 23–21 lead with 6:04 left in the game. After the kickoff, Aaron Rodgers replaced Matt Flynn to lead a hopeful game winning touchdown drive, but Rodgers forced a ball into coverage and it was intercepted by Tampa Bay. On the next play, Tampa Bay RB Earnest Graham ran the ball all the way down to the 1-yard line and scored a rushing touchdown on the next play to increase their lead to 30–21. 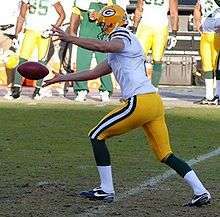 With the game out of reach, Matt Flynn replaced Aaron Rodgers again and turned over the ball on downs. The Packers drive continued into the 4th with a nice pass to Donald Driver for a gain of 8 on 3rd and 5 to the Seattle 22-yard line. Grant rushed for 7 yards on first down and 1-yard on 3rd setting up a 10-yard pass to Jordy Nelson to the Seattle 4-yard line. After a no huddle two-yard gain by Ryan Grant, Rodgers dropped back to pass on 2nd down and tossed to ball to FB John Kuhn who caught the ball on his knees for the touchdown. The Packers extended their lead to 24–10. With Seattle in a 14-point hole with 11:23 left in the game, Charlie Frye dropped back to pass on the 3rd play of the drive at Seattle's 33-yard line. Charles Woodson who was covering a wide receiver up the sideline let his receiver go and stepped in front of the crossing TE John Carlson for his 4th interception of the season. The Packers ran the ball for no gain and Rodgers was sacked on 2nd down. 3rd down was a completed to recently activated practice squad running back DeShawn Wynn for 7 yards but he couldn't reach the 1st down marker. Mason Crosby then kicked a 51-yard field goal to increase the Packers lead to 27–10 with 8:41 in the game remaining. On the next drive Charlie Frye trying to lead an improbable comeback threw deep to Koren Robinson streaking down the left sideline. The ball was slightly under thrown and CB Tramon Williams intercepted the ball at the Packers 9-yard line. Tramon returned the ball to the Packers 24-yard line for 15 yards. With the Packers trying to run out the rest of the clock, Ryan Grant rushed the ball twice for −1 on 1st down and 3 yards 2nd down. Rodgers pass to Ruvell Martin was incomplete on 3rd down and the Packers punted. With 5:15 left in the game, The Seahawks managed to move the ball effectively against the Packers prevent style defense and managed to score their second touchdown of the day at 3:17 with a Charlie Frye 5-yard pass to WR Keary Colbert to narrow the Packers lead to 27–17. The Seahawks down by 10 with 3:14 left in the game attempted an onside kick which was recovered by CB Jarrett Bush at the Seattle 43-yard line. Ryan Grant secured the victory with a 5-yard gain on 3rd and 4. Ryan Grant ran the ball for a 6-yard gain on first down and Rodgers finished the game with two kneel downs to run out the clock. After the field goal, The Packers attempted to onside kick but the ball went out of bounds after 15 yards. On the retry, Mason Crosby kicked the ball out of bounds again but this time it was much farther down field. The ball was then placed at the Colts 45-yard line but an unnecessary roughness penalty moved the ball back to the Colts 30-yard line. On the Colts first drive, they seemed to be able to move the ball very well with runs by the injured starter Joseph Addai's replacement Dominic Rhodes paired with a 9-yard pass to TE Dallas Clark. After a 15-yard unnecessary roughness penalty on CB Tramon Williams on 3rd and 1 at the Colts 39, QB Peyton Manning connected with WR Reggie Wayne for a 15-yard gain on the next 3rd down to the GB 16-yard line. RB Dominic Rhodes rushed the ball four consecutive times and capped the drive with a 3-yard rush for the touchdown. The Colts took the 7–3 lead with 4:06 left in the 1st. After the punt the Packers offense started their third drive of the day at the Green Bay 11. The Packers quickly got out of the shadows of the goal post with a 24-yard pass to WR Donald Driver to the 35-yard line. After a short 3-yard gain by Ryan Grant and two 3-yard receptions by Donald Driver, the Packers were faced with a 4 and 1 at their own 44-yard line much like the Colts on their previous drive. Instead of punting like the Colts did, the Packers kept their offense on the field a managed to get the first down on a nice 7-yard rush by Ryan Grant. The Packers moved the ball down to the Colts 33-yard line with a few short runs by Ryan Grant mixed with a short pass to RB Brandon Jackson for 9 yards. On 2nd a 7 Rodgers dropped back to pass and looked to throw to WR Greg Jennings but decided to dump the ball off the Brandon Jackson for the second time on the drive but he was tackled for a 1-yard loss. During the play a flag was thrown for illegal use of the hands on CB Tim Jennings who was coving Greg Jennings on the play. After a rush for no gain on 1st down at the Colts 28, Rodgers connected with WR Ruvell Martin for 17 yards to the Colts 11-yard line. The Packers scored their second touchdown of the day on the next play with an 11-yard rush by Ryan Grant. The Packers now held a 17–7 lead with 2:53 left in the half. The Packers took over possession but failed to move the ball and was forced to punt. During the punt, Colts Tim Jennings was flagged for defensive delay of game and the Packers were awarded 5 yards and a 1st down. The Packers then managed to move the ball down to the Colts 11 with some short gains on the ground by Ryan Grant. The highlight of the drive took place when FB Korey Hall received a pass from Aaron Rodgers and hurdled over the on coming defender. The drive ended when Ryan Grant couldn't get past the 1st down marker on 3rd down and they had to settle for a successful 29-yard field goal by Mason Crosby to extend the lead to 27–7. With the win, the Packers improved to 5–5. Green Bay's deficit increased in the third quarter as Brown gave the Texans a 41-yard field goal. In the fourth quarter, the Packers took the lead as RB Ryan Grant got a 6-yard touchdown run. However, the Texans replied with Schaub completing an 11-yard touchdown pass and a 2-point conversion pass to wide receiver Andre Johnson. Green Bay would tie the game as Rodgers completed a 9-yard touchdown pass to wide recevier Jordy Nelson, yet Houston pulled away as Brown nailed a 40-yard field goal as time ran out. 1 2 "Packers Place Franchise Tag On DT Williams, Release TE Franks" (Press release). Green Bay Packers. 2008-02-20. Archived from the original on 2008-02-25. Retrieved 2008-03-04. ↑ McGinn, Bob (2008-02-29). "Packers release WR Carlyle Holiday". JSOnline.com. Archived from the original on 2008-03-04. Retrieved 2008-04-02. ↑ "Packers Trade Williams To Cleveland" (Press release). Green Bay Packers. 2008-03-01. Archived from the original on 2008-05-09. Retrieved 2008-03-04. ↑ Thompson, Ted (2008-03-04). "Favre Informs Thompson He Intends To Retire". Green Bay Packers. Archived from the original on 2008-03-07. Retrieved 2008-03-04. ↑ Dougherty, Pete (2008-03-13). "Walker Leaves For Ravens". PackersNews.com. Archived from the original on 2008-04-22. Retrieved 2008-03-20. ↑ Bedard, Greg (2008-03-26). "Davis announces retirement, joins staff". JSOnline.com. Archived from the original on 2008-03-28. Retrieved 2008-03-26. ↑ Green Bay Packers (2008-05-09). "Packers Release WR Koren Robinson". Green Bay Packers. Archived from the original on 2008-05-12. Retrieved 2008-05-09. ↑ PackersNews.com staff (2008-06-05). "Offensive Lineman Released". greenbaypressgazette.com. Retrieved 2008-06-05. ↑ Rob Demovsky (2008-07-23). "Packers sign Giacomini, Swain, Flynn". greenbaypressgazette.com. Retrieved 2008-07-24. ↑ Rob Demovsky (2008-07-24). "DeBauche a casualty of new roster limit". greenbaypressgazette.com. Retrieved 2008-07-25. ↑ JSOnline.com Beat Writers (2008-07-26). "Packers Waive TE Peterson limit". JSOnline.com. Archived from the original on 2008-07-27. Retrieved 2008-07-26. ↑ "Packers Trade Favre to Jets limit". Foxsports.com. Archived from the original on 19 August 2008. Retrieved 2008-08-06. ↑ "Packers Make Five Roster Moves To Reach 75-Player Limit". Packers.com. Archived from the original on August 28, 2008. Retrieved 2008-08-25. ↑ Glazer, Jay (2008-03-04). "Favre has decided to call it a career". Fox Sports. Archived from the original on March 5, 2008. Retrieved 2008-03-04. ↑ Walker, Don (2008-03-04). "Favre retiring, Fox Sports reports". Milwaukee Journal-Sentinel. Archived from the original on 2008-02-16. Retrieved 2008-03-04. ↑ "Brett Favre Set to Retire After 17 Years". Google. Associated Press. 2008-03-04. Archived from the original on March 9, 2008. ↑ "Statement From Packers General Manager Ted Thompson". 2008-03-04. Archived from the original on December 30, 2008. ↑ DeLong, Katie (2008-03-04). "Favre's Agent: "We Found Out Last Night"". Journal Communications Inc. Associated Press. Archived from the original on 14 March 2008. Retrieved 2008-03-04. ↑ "Favre chosen for Madden 09 cover". ESPN.com. 2008-04-25. Archived from the original on 2008-04-29. Retrieved 2008-04-25. ↑ "Favre Would Help Packers if Needed". ABC News. 2008-04-10. Retrieved 2008-04-24. ↑ Mortensen, Chris (2008-07-02). "Favre has 'itch' to ditch retirement, report to camp". ESPN.com. Archived from the original on 5 July 2008. Retrieved 2008-07-02. ↑ "Favre seeks unconditional release from Packers, sources say". ESPN. 2008-07-11. Archived from the original on 14 July 2008. Retrieved 2008-07-11. ↑ "Packers GM, coach say team won't release Favre despite request". ESPN.com. July 13, 2008. Archived from the original on 15 July 2008. Retrieved 2008-07-16. ↑ Chris Jenkins (July 15, 2008). "Favre Says He's Tempted to Show Up at Packers Camp". The Washington Post. Retrieved 2008-07-16. ↑ "Favre now owns a unique no-trade clause". NFL.com. 2008-07-15. Archived from the original on 28 August 2008. Retrieved 2008-07-22. ↑ "Favre to Fox News: Packers should let me play elsewhere". ESPN. 2008-07-14. Archived from the original on 17 July 2008. Retrieved 2008-07-14. ↑ "Favre shares his side of the story in Fox News interview". CNNSI.com. 2008-07-14. Archived from the original on 2008-07-17. Retrieved 2008-07-14. ↑ "Exclusive: Brett Favre on His Packer Replacement and Playing Again". FoxNews.com. July 15, 2008. Archived from the original on 20 July 2008. Retrieved 2008-07-16. 1 2 "Favre has no definite plans to apply for reinstatement". ESPN.com. July 16, 2008. Archived from the original on 19 July 2008. Retrieved 2008-07-16. ↑ Jay Glazer (July 16, 2008). "Source: Packers say Vikings tampered with Favre". FOXSports.com. Retrieved 2008-07-16. ↑ "Vikings refuse to address Packers' claims of Favre tampering". ESPN.com. July 17, 2008. Archived from the original on 21 July 2008. Retrieved 2008-07-17. ↑ Jon Krawczynski (August 4, 2008). "Goodell says Vikings didn't tamper on Favre". Yahoo! Sports. Archived from the original on 10 August 2008. Retrieved 2008-08-06. ↑ "NFL grants Favre reinstatement; sources say QB job is open". ESPN.com. August 3, 2008. Archived from the original on 6 August 2008. Retrieved 2008-08-03. 1 2 "Sources: Favre has spoken to Bucs and Jets as potential trade suitors". ESPN.com. August 5, 2008. Archived from the original on 8 August 2008. Retrieved 2008-08-06. ↑ Jay Glazer (2008-08-06). "Packers trade Favre to Jets". Fox Sports on MSN. Archived from the original on 19 August 2008. Retrieved 2008-08-06. The month-long saga has finally come to an end, with the Packers agreeing to trade their future Hall-of-Fame quarterback to the New York Jets, FOXSports.com has learned. ↑ greenbaypressgazette.com Beat Writers (2008-07-29). "Evening practice is sloppy, toolimit". greenbaypressgazette.com. Retrieved 2008-07-28. 1 2 3 4 Fanning, Tom (2008-08-03). "Family Night Notebook: Secondary Looks Sharp". Packers.com. Archived from the original on September 2, 2008. Retrieved 2008-08-04. 1 2 Packers.com (2008-09-24). "Packers Sign DT Bledsoe To Practice Squad". Packers.com. Archived from the original on September 26, 2008. Retrieved 2008-09-24. ↑ Packers.com (2008-10-27). "Packers Sign CB Cox To Practice Squad". Packers.com. Archived from the original on December 28, 2008. Retrieved 2008-10-27. ↑ Packers.com (2008-10-15). "Packers Sign LB Havner To Practice Squad". Packers.com. Archived from the original on October 30, 2008. Retrieved 2008-10-15. ↑ Will Blackmon Named NFC Special Teams Player of the Week Archived December 26, 2008, at the Wayback Machine. ↑ Aaron Rouse Named NFC Defensive Player Of The Week Archived December 30, 2008, at the Wayback Machine. ↑ Mike McCarthy Named Week 7 Motorola Coach Of The Week Archived December 30, 2008, at the Wayback Machine. ↑ Mike McCarthy Selected As Motorola NFL Coach Of The Week Archived December 28, 2008, at the Wayback Machine. ↑ RB Ryan Grant Selected As FedEx Ground NFL Player Of The Week Archived December 28, 2008, at the Wayback Machine. ↑ http://www.packers.com/news/releases/2008/10/02/2/ Archived January 7, 2010, at the Wayback Machine. ↑ http://www.packers.com/news/releases/2008/11/12/1/ Archived January 7, 2009, at the Wayback Machine. ↑ http://www.packers.com/news/stories/2008/12/30/1/ Archived January 1, 2009, at the Wayback Machine.